How do physicians diagnose RA? Physical Exam: Your doctor will check your reflexes and muscle strength and examine your joints for swelling, redness and warmth. Blood tests: Your physician will order tests to check for inflammatory activity in the body. People with RA tend to have an elevated erythrocyte sedimentation rate (ESR, or sed rate) which can be seen in a blood test. Other common blood tests taken will look for a rheumatoid factor and anti-cyclic citrullinated peptide (anti-CCP) antibodies. X-rays: Your physician may recommend X-rays to help track the progression of rheumatoid arthritis in your joints over time. Morning stiffness of more than an hour most mornings for a period of at least six weeks. 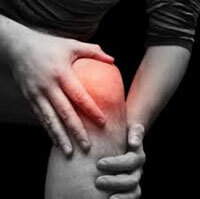 Arthritis and soft-tissue swelling of more than 3 of 14 joints/joint groups, present for a period of at least six weeks. 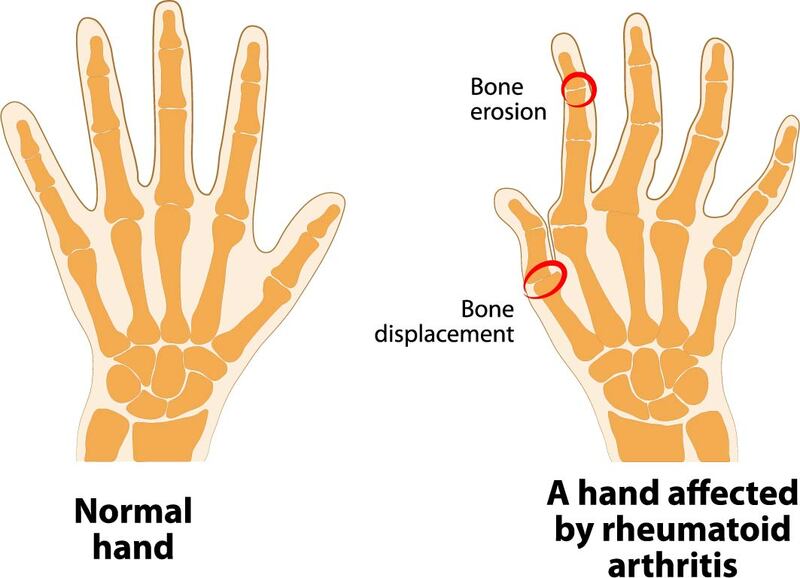 Arthritis of hand joints, which are present for a period of at least six weeks. 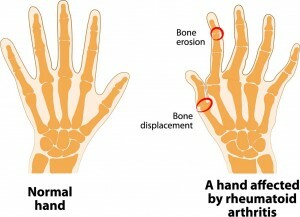 Symmetric (occurring on both sides of the body evenly) arthritis, which is present for a period of at least six weeks. Subcutaneous nodules (lump under the skin) in specific places. 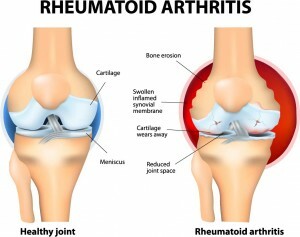 Rheumatoid factor (an antibody that is detectable in the blood of 80% of adults with rheumatoid arthritis) at a level greater than the 95th percentile . Radiological changes (as seen in an xray) suggestive of joint erosion. The cause of RA is currently unknown, but it is a very active area of worldwide research dedicated to RA. Environmental factors: Scientists have reported that smoking tobacco, exposure to the mineral silica (many common construction materials contain silica including, for example, asphalt, brick, cement, concrete, drywall, grout, mortar, stone, sand, and tile) typically in dust form due to grinding or cutting of the material,and chronic periodontal disease (inflammation affecting the bone and tissues of the teeth) can all increase the risk of developing rheumatoid arthritis. Infectious Agents: Although bacteria, viruses, and fungi have long been suspected, none has been proven as the cause. Heredity: It is believed that the tendency to develop RA may be inherited genetically. Certain genes have been identified that increase the risk for rheumatoid arthritis. As of now, there is no known cure for rheumatoid arthritis. 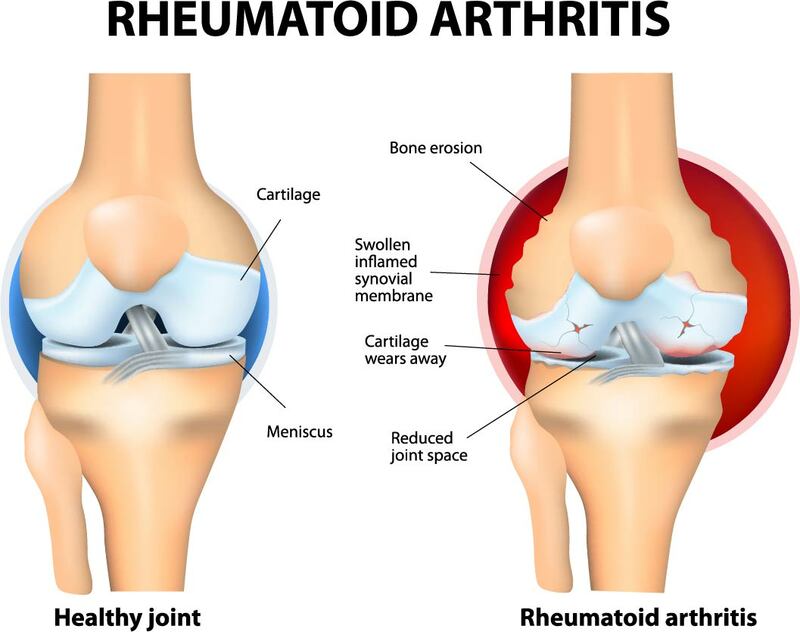 The main goal of treatment in rheumatoid arthritis is to maximize joint function, reduce inflammation and pain in the joints, and prevent further damage and deformity in the joints. Receiving early medical intervention has been shown to be key in improving outcomes and the quality of life for RA patients. You will likely be treated by a rheumatologist, as they specialize in treating people with arthritis and other rheumatic diseases. This is also the physician who typically treats lupus patients. Your physician will monitor your levels of disease activity, or inflammation, on a regular basis through exams and blood tests. This will help tell both you and your physician how well treatment is working. Your medications and therapies may be changed, your dosages may be adjusted, or new medications might be added, based on the findings of these tests. 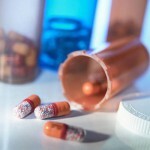 There are a number of medications available to help ease symptoms, reduce inflammation, and slow the progression of the disease. No single drug works for everyone but many people find treatments that are very effective. Assistive devices (canes, railings, adapters for making utensils easier to hold, etc. )to make daily life easier when living with limited mobility and pain. Surgery- Surgical repair may be considered if medications and other treatments fail to prevent or slow damage to the joints. This option can reduce pain, correct deformities and help restore the ability to move the affected joint(s). Because surgery carries inherent risks, please discuss any benefits and risks with your doctor. Alternative or complementary treatments can also help relieve the pain and discomfort from RA and other autoimmune diseases. Essential oils and even CBD oils. With everything, discuss all alternative or complementary treatments with your doctor.